The cutthroat competition in the business is on the edge and to edge over the competitors; the outdoor advertisement is an effective medium to leave that strong impression on the consumer’s brain and convey them why you are the best and for what we have proposed an advertisement on the bus, a guaranteed medium to cajole audience at the best and get the unmatched lead in the business, which has entitled us to reckoned as the best outdoor advertising company in Ahmedabad. Have you ever noticed advertises glued to the buses, if yes, then why don’t yours advertise on the bus wouldn’t. Buses continually circulate in the entire city across a week and hence give broadcast your product/ service to targeted audience time and time again, which not only conveys your message but also builds exceptional recall for your brand at the same and that’s what has made the advertisement on the bus a thriving approach. If you are thinking buses are visually unavoidable, and then you are correct, it is and the large size and mobility is an extra perk that you can reap by investing in the advertisement on bus. We are in the business of the bus advertisement for more than 80 years and hence are potent to outline the best strategy for your bus advertisement that can ensure the highest return on investment. The in-depth know-how of colors and expertise in the high-resolution graphics is paramount to create a great impact on the viewer and outlast for a long period of time and is what you can experience by availing our advertisement on bus service. Further, we have a large network of buses those travels to every area of the city and ensure to give your brand highest audience exposure throughout the service hours. Our advertisement on bus service is delivering sensational returns to every single investor and is what exhibits our skills that one can advantage by contacting us today. The large size and continues circulating of the buses have the capability to seize highest audiences across the city, even from the busiest areas where billboard are not permitted and convey the brand message with an ease. The buses have high frequency when the public is out, generally out of the home, school, college, office and hence it broadcasts your advertise when they are almost out, hence the right time availability of the buses gives high brand exposure. The buses circulate all across the city almost 18 hours a day and hence potent to give highest brand exposure throughout to every passerby vehicular and pedestrian. 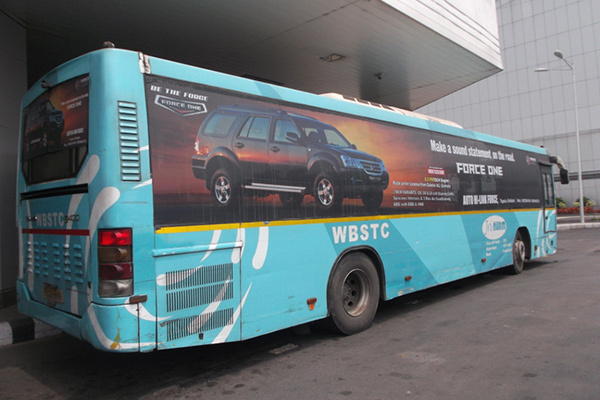 Advertisement on bus with the bold text and excellent color combination has the greatest potential to draw a huge number of audiences at a lower cost than that of newspaper, TV, radio, which is costly too.